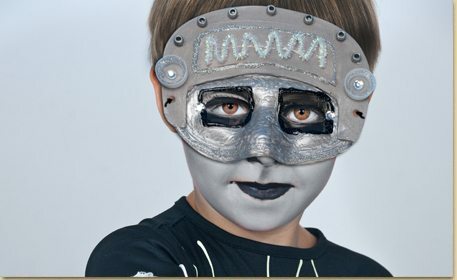 This Halloween you can create a futuristic space age robot mask! You could even use a paper bag and aluminum foil to create an outfit to match! Silver Glitter Glue 8 oz. Download, print and cut out the template. To download, click the “Template” button. 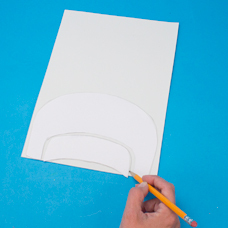 Trace the template on a foam sheet. 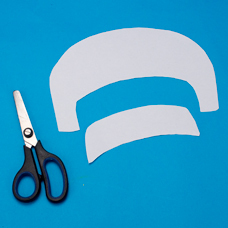 Tip: Layout your template pieces close together on the foam to conserve the rest of the foam for use in future projects. 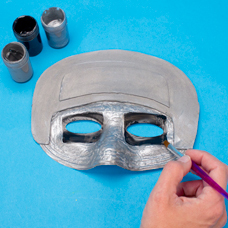 Glue the large foam to the top of the plastic mask. Glue the smaller foam piece to the large foam piece. Paint the mask and foam gray and black. Once the gray is dry, add a thick layer of silver paint on top of the gray. 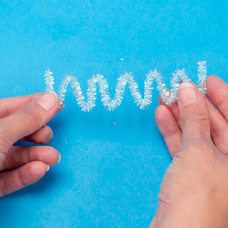 Fold a shimmer stick back and forth like an accordion. 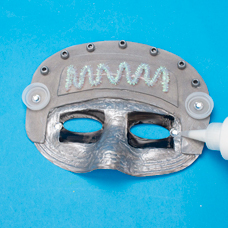 Glue the shimmer stick to the smaller foam piece on the mask. 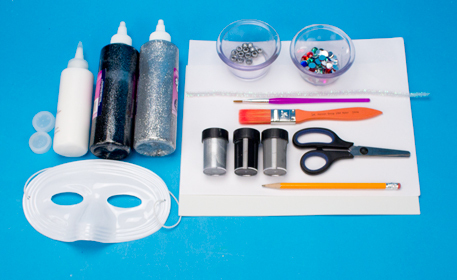 Add silver pony beads along the top of the mask as rivets and glue a bottle cap on each side of the mask. Embellish with acrylic jewels. 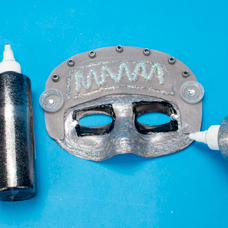 Finish decorating the mask with black and silver glitter glue. 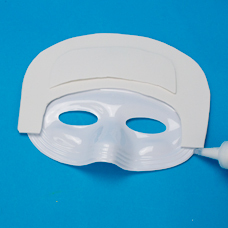 When the mask is dry, replace the elastic cord. If needed use a hole punch to create holes for the cord in the foam.